I use the word movement instead of exercise because I feel like it is a much more positive way to get me motivated. It has way more meanings, like: I’m moving. I’m flowing. I’m grooving. It has a sexier appeal to it than; I’m exercising (blah!). Being active, and finding a way to move your body that you love, isn’t just good for your body. Daily movement is good for your mind, body and soul. If you move more than you sit, you will make healthier food choices, you will sleep better, you will decrease stress, boost your immunity, and you will literally be happier because movement releases happy endorphins into your brain. Every move you make can increase your odds of promoting whole-body health. Fitness doesn’t need to come in the form of an expensive gym membership, that is why I’m calling it movement. There are many things you can do right at home or outside. 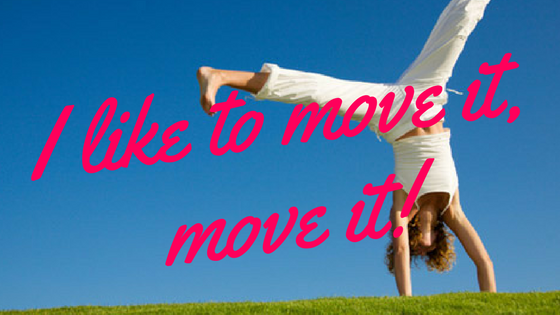 Your body and mind just loves it when you move and get active, it doesn’t care what you do. If you sit at a desk throughout the day, get up and move. Every 60 to 90 minutes, get up, stretch and take deep breaths. Do this for about 2 minutes. Don’t worry about your lack of production time while this happens, you will actually be more productive, and shaper on your game, if you do this consistently. Not only do we sit for too many hours, but we also don’t breathe properly throughout the day. Do you ever notice how much you hold your breath? Breathing in deep gives your brain oxygen (which is needs), which in turn keeps you feeling energized. While talking on the phone, stand up, stretch out your neck, even do some squats if you want. Just get out of your chair. If you are unable to stand up, just move your upper body, raise your arms, and stretch out your back. If you go into a building that has an elevator, take the stairs instead. Wherever you park, park further away, so you can walk. While making dinner, turn up your favorite song and dance around the kitchen. The point of this challenge isn’t to add more daunting tasks to your to-do list, it is to have some fun (something we all need) and show you that exercise comes in many forms.